Picture of: a cassette tape of one of the first audio projects I ever did waaayy back in the day. It's still in it's shrink wrap. Picture of: a frame grab from a video I was working on today. 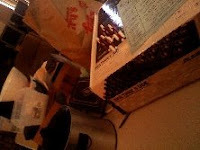 Today I: took daughter #1 to and from her volunteer job; spent most of the day recording new storytelling and promo videos; spoke on the phone with a new local client; edited videos; cleaned up after a storm that did some serious damage around here tonight; posted new video at my main blog. 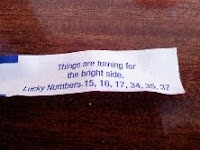 Picture of: fortune-cookie fortune that reads, "Things are turning for the bright side." Today I: odd day; went to quick and cheap Chinese-food lunch with a few family members; worked on new flyer and postcard for "Ancient Secret of Public Speaking" workshop; attended a telecourse presented by another; answered some mastermind-group emails; updated some URL renewals and cancellations; researched Google search word ratings; watched "The Daily Show" tackle the Democratic Convention; sent a Twitter to John McCain's PR people advising them that they need to hire a storyteller coach (who is in the Senator's state) to help said Senator compete with the storytelling going at the DNC. Call me, McCain PR people, your man needs me. 08.25.2008 Monday: Notify the Press! 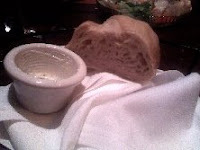 Picture of: last piece of bread from our meal tonight. Today I: had a staff meeting at breakfast and worked on calendars; updated and retooled the Storytelling 101 package to a different, lower price point; worked on the press release for the "Ancient Secret of Public Speaking" workshops coming up in October and November; set the date for the next live version of the "Outside In Artist Marketing Workshop" for February 26-28 in Phoenix Arizona; did some research on a new story and found some interesting old variants- that kind of storytelling stuff is what I love in creating new stories to tell; had a late night dinner with my wife to celebrate our anniversary (Aug 15). Picture of: the camp meeting hall where we met this weekend. Today I: packed up my things from the hotel room; ate hotel breakfast; travelled to the camp where I was speaking; presented my morning storytelling presentation; drove back down the mountain; had lunch in town and then began the trek back to my house; stopped by the post office to see what fun was in there from the last few days; unpacked things at home; updated Email; read a new report about using Adwords; let my FMS win tonight and vegged out watching "Lord of the Rings" aka "Let's Watch Hobbits Cry." 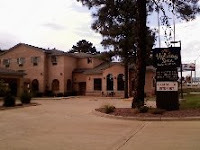 Picture of: the Holiday Inn where I am staying in Payson, AZ. 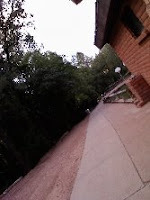 Today I: did both a morning and evening storytelling session with the family groups here at the camp; took a check to the bank here in town; in the downtime, caught up on some emails and writings. 08.22.2008 Friday: Driving to Events. 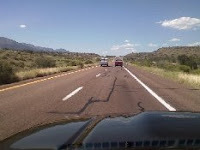 Picture of: the long road as I drove through Arizona today. Today I: took daughter #1 to work; did some banking; drove to my hotel today in Payson Arizona, on the Mogollon Rim, about 2.5 hours and a lot of gas from my home; got settled in hotel; drove to the event tonight and performed a small storytelling program; back to hotel and dinner; calling it a night and I will be back out to the event in the morning. Extra Credit: Can you pronounce Mogollon? Picture: the cover of the new college textbook "The Oral Tradition Today: An Introduction to the Art of Storytelling" by Liz Warren. Nice job, Liz. Today I: spoke with the sponsors for this weekend's storytelling event; emailed a potential new sponsor in New York; did the bank and post office errand run; cleaned out the drain of the tub in the "kids'" bathroom at our house; did an in-person coaching session with two clients tonight in their storytelling projects; twittered; was pleased to see our information products starting to sell; daughter #4 wants you to know that the dog is not mean- I told her that I knew that already. She also wants you to know that the picture a few days ago from the Boot Camp was of her hands making that sandwich. 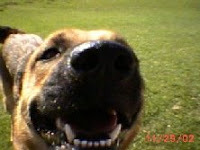 Picture of: an old 2002 picture of our very first dog, who is now a slightly crazy, sneaky critter who likes to have things her own way or she is mean to other dogs and people. She is easily offended. It's best to ignore such precious critters when they behave badly. Today I: made flight arrangements for a trip to Philadelphia; booked hotel rooms for Tennessee and Philly; had lunch with my wife to work through calendar things; cancelled the Philadelphia version of the "Storyteller.net Live" show; made meeting room arrangements for the "Ancient Secret of Public Speaking" workshops in October and November; worked on publicity for the ASPS workshop; talked with a client about our delay on the audio files; made car arrangements for my out-of-town trip this weekend; made chili for dinner; twittered; began work on a new story today; cleaned out my hard drive, archived some files and found the picture of the dog gracing this note; I am lucky to have peers and associates who are smart, kind and supportive. Picture of: the things that still needed to be put away after the "Outside In Storytelling Marketing Boot Camp" from this weekend. 08.17.2008 Sunday: The Camp Concludes Cordially. Picture of: screen of the video camera as daughter #1 video-ed me as I taught today at the"Outside In Storytelling Marketing Boot Camp" today. Today I: got up really early to print up a few things for my students today at the camp; spent the last morning of camp today with good students, good family, good learning and good food (okay, the box lunches were not as good as I wanted them to be); hotel had a revivalist-style church in the meeting room next to us and they were *loud*- gladly my students were hang-loose types of people- thanks; got to teach something today in the OISBCamp that is really a cutting-edge marketing process for artists- fun and challenging to start sharing that learning with others; had one student take the discount coaching slot at the end of the camp so we spent an hour talking about her "map"; cleaned up the camp- but actually my fine family had already done much of it while I met with the student; made the trip home and took a nap; wandered down to make dinner; edited some audio files; wrote you this note; gonna go lay low for while. Picture of: the lunch buffet at this weekend's "Outside In Storytelling Marketing Boot Camp." 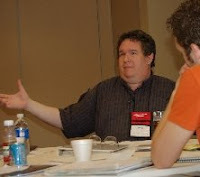 Picture of: me teaching tonight at the "Outside In Storytelling Marketing Boot Camp" in Glendale, Arizona. Today I: got my office phones fixed; cell phones are a pain in the neck- also I take these pics with cell phone- borrowed camera for this weekend; had to buy one of these cheap pay-as-you-go cell phones for our staff to communicate this weekend; assembled all the equipment we need for the OISBCamp; moved into the hotel conference room and set up; welcomed our students to camp and had a fun Mexican-style dinner; the accountant was the guest speaker tonight- great guy and thanks, Alex; during the talks tonight, we gave one tip out will immediately save one participant $800 per year by changing one aspect of her business. That tip alone is worth more than she paid for the camp. The OISBC works. And...August 15 is the wedding anniversary for Michelle and I. Michelle, I love being married to you and would marry you again in a heartbeat. I love you, M.
Picture: the schedule page of the new workbook for the "Outside In Storytelling Marketing Boot Camp." 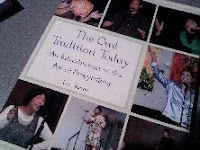 went to Kinko's to get new workbook printed and bound there. Kinko's wants you to believe they are a great support for the small business person....and I completely agree. 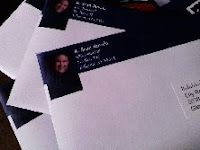 Me love Kinko's; spoke with a potential client on the east coast (U.S.) about coming out to them for a corporate workshop-talked with different potential customer yesterday also across the country on east coast. Busy. Picture of: screenshot of the web page for the "Ancient Secret of Public Speaking" Live Training Workshop I just posted. Today I: have been trying to get through an FMS flare; attended a conference call for a master-mind program I am participating in; went to the bank and post office; completed the website and registration for our new "Ancient Secret of Public Speaking" workshop. I am very excited about our workshop that offers pro-level training in public speaking work offer the one thing "they didn't teach you in school" about really being effective in public speaking. Come take a look. Come join us; talked to the hotel about the set up for this weekend's Marketing Boot Camp. Picture of: stack of mail waiting to go out. Today I:In the last few days I; finalized the meal choices with the caterer for OISBCamp next week, did post office and ban runs; prepped and mailed last-minute paperwork for the students in next week's "Outside In Storytelling Marketing Workshop;"worked on a dozen-page evaluation of my current work vs. where I want to be with my speaking and storytelling business over the next year; participated in a master-mind group; updated blogs; posted the new "Storytelling 101" kit and website; evaluated a CD for a client and wrote a jacket-quote for them; worked with another phone coaching client. 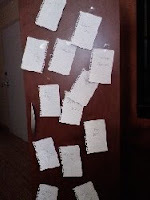 Picture of: my closet-door-o' notes on the things I need to do, write and create. Today I: sequestered myself away to get caught up on the pile of things to do- thank you Marriott Reward Points; posted the noodle blog; left my monastery to go have dinner with my wife; came back and worked some more; left the movie "Titanic" running in the background on the TV. The movie is also known as "Two brat kids do whatever they want on a boat. "; noted that the mother telling bedtime story to children at the end of that movie is telling an Irish story, probably of "Niamh choses Oisin to be her lover and live with her in Tir Na Nog" Before you comment, remember that there is a lot of ways to spell those names. 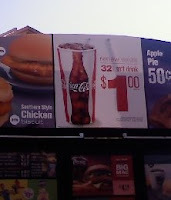 Picture of: the place to get $1 drinks in a drive-thru location. Record setting temps in AZ, so this a very popular offer. Today I: prepped for my big writing day on Saturday; talked with a coaching client; did bank and post office errands; shopped for Popsicles(tm) for sick child and bought cheap frozen pizzas for family "pizza and snacks" night; dug around for "Beauty and the Beast" variant; did Emailing for the "Outside In Storytelling Marketing Boot Camp" coming up in just a few weeks!